This paper quilling art has been inspired by the vibrant colours of majestic Rajasthan. 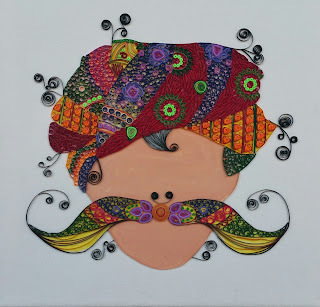 The royal mustaches and the colour splashed pagris (headgear) set the rajasthani mens apart. Don't you agree that Rajasthanis have got some SWAG! Thanks for joining us at IQCG. Thank you Gouri. I am very glad to have participated in IQGC. Nice idea and lovely quilling. Lovely Quilling Dimple. Thank u for participating in IQCG.